The just-concluded conference was markedly different from its earlier editions in the sense that many participants, including Russia and India, brought political and security issues to the fore in a much more forceful manner. Russia made a strong pitch for resolving the contentious issues involving Iran and North Korea at one of the biggest diplomatic gatherings of the year, the 11th foreign ministers’ level meeting of the 51-member Asia-Europe Meeting (ASEM), hosted for the first time by India at Gurgaon near New Delhi on November 11-12. The just-concluded ASEM conference was markedly different from its earlier editions in the sense that many participants, including Russia and India, brought political and security issues to the fore in a much more forceful manner. Usually, this outfit’s main focus is on social and economic issues, though it also has a significant share of political component in its agenda. Apart from Iran and the Korean Peninsula situation, the participants also discussed in depth other international issues like the Syrian crisis, the Israeli-Palestinian confrontation, the overall situation in the Middle East region, negative consequences of the outside intervention in the events of the Arab Spring and Asia-Pacific. ASEM, a unique forum dedicated to bringing Asia and Europe together, accounts for about 60 percent of the world’s population, 52 percent of the global GDP, and 68 percent of world trade. ASEM ministerial meetings are biennial and alternate with annual summit meetings. Russian foreign minister Sergei Lavrov, while participating in the Conference, urged Iran and the six world powers (UNSC P5 plus Germany) not to miss the chance of reaching an agreement after November 7-9 talks in Geneva over Tehran’s nuclear energy programme. He also warned against “one-sided geopolitical considerations” while dealing with the issue. “Now it is important not to miss the chance, not to hinder forward movement and be guided only by unconditional priority of strengthening nuclear non-proliferation regime and not by one-sided geopolitical considerations,” Lavrov said. He remarked that the Geneva talks demonstrated ‘encouraging signs’ and underlined the need for more efforts to be made by Iran and the ‘sextet’ of international mediators to reach an agreement. Lavrov said the ASEM conference the recent G20 summit in St Petersburg have a common agenda. “ASEM priorities, which we share, are to a large extent close to the line Russia has chosen to pursue during its G20 presidency. We pay particular attention to such issues as toughening food safety regulations, providing broader access to financial services, increasing the level of financial literacy, creating modern infrastructure and developing human resources,” Lavrov said. On the situation in the Korean Peninsula, Lavrov said the interests of both the Koreas should be taken into consideration while resolving the issue. He told the ASEM gathering that Russia actively supports China’s point of view that no country has the right to defend itself while afflicting other country. “We continue arranging the soonest possible resumption of six-sided talks on resolving the nuclear problem on the Korean Peninsula. There is no alternative to these talks. We believe it’s unacceptable to use the current situation as an excuse for building-up modern weaponry in northeastern Asia, including introducing additional elements of the global missile defence system,” Lavrov stated. As Chair of ASEM, India has made a conscious effort to push for a fresh approach that would reorient discussions of ASEM meetings from dialogue towards actual tangible cooperation thereby taking ASEM to the next level of maturity. 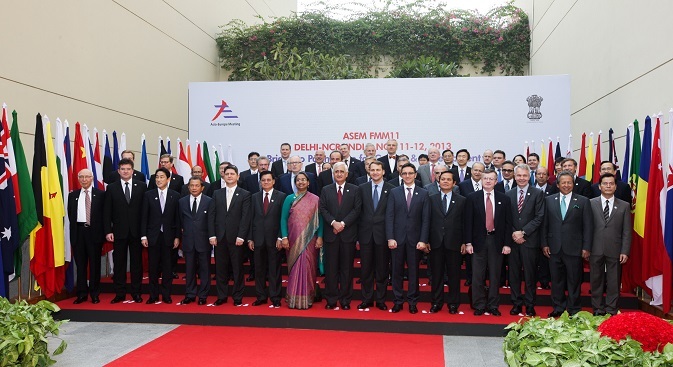 The 11th meeting of ASEM foreign ministers had two Plenaries and a Retreat. The first Plenary focused on Economic Growth and Sustainable Development - Challenges and Opportunities in Asia and Europe. The second Plenary had a discussion on the topic “Non-Traditional Security Challenges”. At the Retreat on the second and last day of the meeting on November 12, the participants had a free-flowing discussion on regional and international issues of interest to ASEM members. All the 51 member countries participated in the meeting – 37 foreign ministers, 12 deputy foreign ministers and two vice ministers.